As one of the more inventive base designs of the previous year, 2015 Topps Fire Football continues that tradition with another bold look. Hobby boxes promise two autographs or autographed relics. The 2015 Topps Fire Football base set features 150 cards, including 50 rookies. Colorful parallels are found in each pack with Silver (1 per pack), Flame (1:4 packs), Orange (#'d), Green (#'d), Onyx (1 per case - Hobby), Blue (#/99), Purple (#/50), Magenta (#/25) and Inferno (1/1 - Hobby). Among several autograph options, Fire Autographs are the primary set and include up to 75 top options from the past, present and future. Essentially a base autograph parallel, there are also a few more versions, including Blue (#/75), Purple (#/50), Magenta (#/25) and Inferno (1/1 - Hobby) parallels. Limited Dual Autographs (#'d) and Triple Autographs (#'d) feature combo signatures. 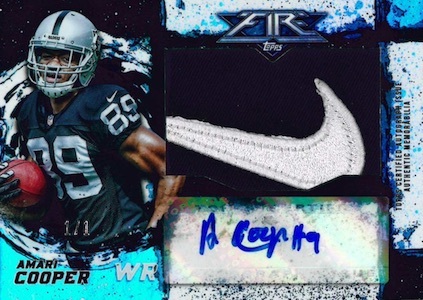 Autographed relics are another main component of 2015 Topps Fire Football. Rookie Autographed Patches combine a sticker signature and small patch. Hobby-only parallels include Blue (#/75), Purple (#/50), Magenta (#/25) and Inferno (1/1 - Hobby) NFL Shield, NFLPA Logo or Laundry Tag. Also limited to hobby boxes, Autographed Swoosh Patch, Autographed NFL Shield Patch and Autographed Team Logo Patch are each one-of-one insert sets. Dual Autographed Relics (#/10) round out the hit options and also include a Patch parallel (1/1 - Hobby). Given the focus on design, inserts are also a major feature of 2015 Topps Fire Football. Averaging five per box, Into the Wild inserts showcase a design featuring the team's mascot. Fire Forces of Nature focus on the natural world with two per box. A hobby exclusive, Fired Up inserts rely on player passion and drop one per box. 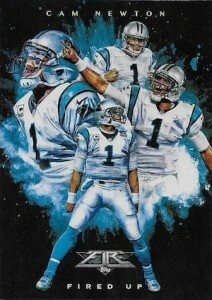 Lastly, Transcendent Touchdowns highlight notable scoring plays with four inserts per box. Parallels include Blue (#/99), Purple (#/50), Magenta (#/25) and Inferno (1/1 - Hobby). 13 cards. Hobby only. 1 per box. ryan � I added some better base images that I found. Obviously Gore is not with the 49ers and he won’t be shown that way in the release, but it offers higher quality detail on the base design. Do you have any pictures of the JUMBO Relics cards? I see there are 52 cards in this set? Patrick � The set does not come out until Wednesday. Images will be available then. I bought some packs today from Target. Thicker card stock, less cards per pack/box but I think it has improved greatly in quality. So many rounded corners in 2014 but these are sharp in 2015. I like the designs especially on inserts. Sticker autos are lame but its priced lower per card so you get what you pay for. The transcendent touchdowns and into the wild inserts are EXCELLENT. The base cards are a bit busy and somewhat hard to distinguish on the parallel side. My real gripe is the blaster states a “Rookie Jumbo Jersey” in the box. The sealed pack says “Rookie Jumbo Jersey” Alas, the Jersey was a jumbo jersey /150 but of A.J. Green, who was a rookie in 2011. These are AMAZING! Favorite Topps cards. 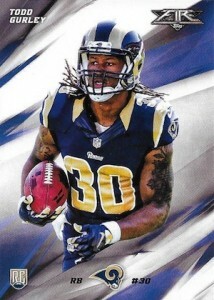 Then reg rookie cards of Gurley/Cooper/White. So not much to complain about for what I spent. These are loaded with good cards but foil cards all have very delicate corners. I messed up corners while putting them in sleeves. Make sure you find a way to get them in carefully. I clip the corners of the sleeves to avoid this. Annoying cause I messed up a flame Mariota. If topps is gonna charge more per card by making a thicker card stock then they also need to have less delicate corners and a higher quality feel next year. Bought 2 boxes from Wal-Mart and got a Kaepernick gold #/299 and Demaryius Thomas relic in fist box and Gronkowski gold #/299 and Jay Ajayl relic which means they have rookie relic cards in retail boxes. Lots of inserts in these also. 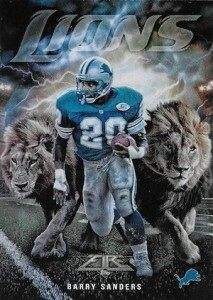 Are there any #s on jumbo rookie relic parallel cards? I haven’t bought any cards in almost 8 years and feel like a total noob for not figuring out I have a Demaryius Thomas parallel #/125. Might unusual to get 3 parallel cards in 2 retail boxes not sure but can’t wait to get a hobby box or two. The foil background is a different color. On relic cards background on photo is a different color. Pulled a green rookie card from the 2 packs at Wal-Mart.Someone took the relic cards from last box they had out. I always think there is a great card in those packs they won’t discount. I just bought my first pack to give it a go. It was an 18 card retail pack from Walmart but it contained 3 Silver Foils (Clive Walford, DeSean Jackson & Warren Moon), 1 Flame Parallel (Matt Forte) and 1 Purple Parallel (Warren Moon 37/50). I was quite surprised to see this many base parallels in one 18 card pack but won’t complain. I dig the look and always enjoy different foil parallels. Finally got a hobby box of these and am very happy. My two auto’s are both rookies Jeremy Langford /500 Ty Montgomery /25 and 3 base parallel /299 Jesse James Alfred Morris /499 Duke Johnson. 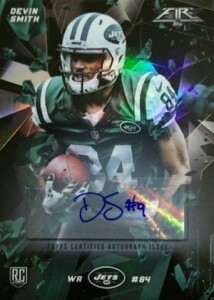 Only wish that magenta auto was Garrett Grayson.